Our ingeniously designed Rest-a-Head will attach to any high backed chair, simply by using gravity. 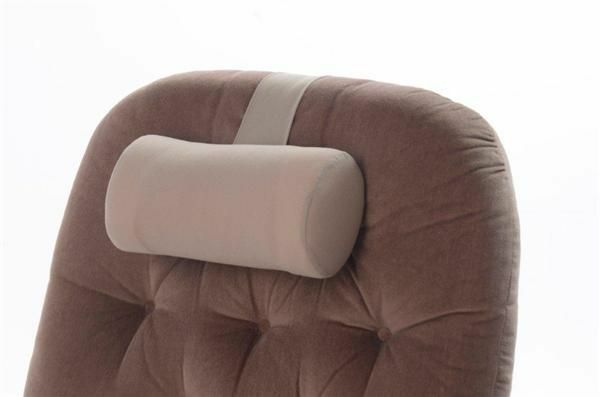 It is ideal for supporting the head and neck whilst sitting in your favourite armchair. Fully adjustable up or down for individual comfort and support. The amount of head support can be adjusted by removing some of the padding. User friendly order system, prompt delivery, excellent product. Just the ticket ! There\'s always been this annoying gap between the back of my head and the back of the chair. Ordinary cushions are no use because they shift and fall down when you move your head. This clever system keeps it right there in place, and you only need to adjust the amount of filling to get the perfect fit ! Good, practical concept. Certainly a lot more comfortable than what I was using before, and doesn\'t keep falling on the floor like the other one did. Came the next day and is great support for my neck. Thank you. Have the perfect headrest upon which to rest my head, whilst thinking of the answer.previous one lasted ten years. Great value. This item is quite useful and makes resting a little more comfortable. However, I think that it is massively overpriced . Very good service, excellent product, did remove some of the filling for perfect results. Would recommend this product.